Summer is a great time for being active, and what better way to be active and stay cool than swimming in the pool? Here are some tips and best practices for keeping kids safe in (and around) swimming pools. An adult should actively watch children at all times while they are in the pool. For infants & toddlers, keep them within arm’s reach and provide “touch supervision”. With older children, adults should be paying attention and be free from distractions like doing chores, talking on the phone, or drinking alcohol. And, of course, the supervising adult must know how to swim. The American Academy of Pediatrics supports swimming lessons for most children 4 years old and older. If children from 1 to 4 years of age are ready to learn to swim, that’s okay too. 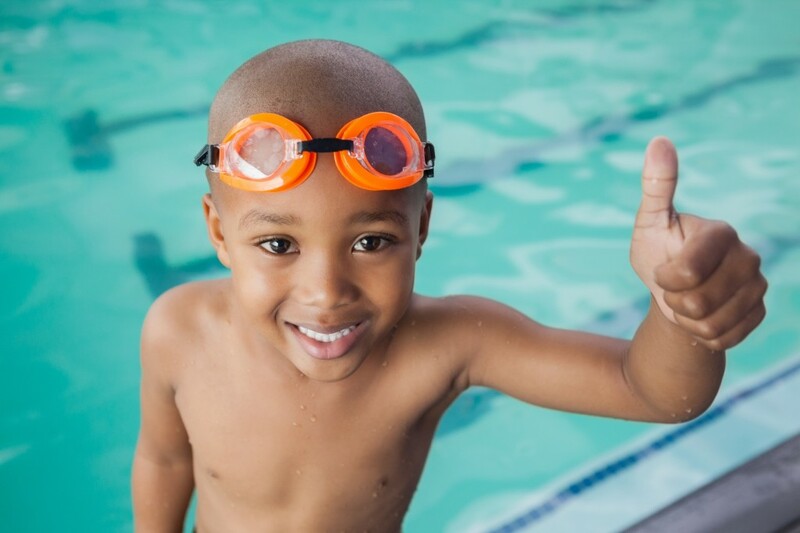 Keep in mind that children develop at different rates, and each child will be ready to swim at their own time. Serious injuries, including to the spinal cord, permanent brain damages, and death, can occur to swimmers who dive into shallow water or spring upwards on the diving board and hit it on the way down. Now that we’ve covered in the pool time, let’s discuss safety when the pool is not in use. Children can climb out a window, or sneak out the door to get into the yard and the pool. To prevent small children from entering the pool area on their own, you need a fence that completely surrounds the pool or spa. When combined with the watchful eyes of an adult, a fence is the best way to protect your child and other children who may visit or live nearby. Pool fences should be climb resistant, and not have anything nearby (such as lawn furniture) that can be used to climb it. They should be at least 4 feet high, have no more than 4 inches between vertical slats, and be free of other footholds or handholds that could help a child climb it. Chain link fences are not recommended as pool fences, as they are generally easy to climb (if they must be used, the diamond should be no bigger than 1 ¾ inches). Having a gate that is well maintained, self-closing, and self-latching, only opening away from the pool can help to prevent little ones from entering, and the latches should be higher than 54 inches from the bottom of the gate. If you have an above ground pool, remove and/or lock the ladders to prevent access. And remember – other protection products like pool alarms, automatic pool covers, and door alarms may be of some benefit, however they are not a substitute for adequate fencing. Ka-Boom! The 4th of July: Celebrate Safely!